The Beerburglar (Homo Heros Vocatus) is a humanoid monster, a subspecies of the Common Hero. Though there is not much outward distinction between the Common Hero (Homo Heros) and the Beerburglar, it was granted subspecies status due to large differences present in the brain structure and overall nervous system  and an extra organ present in the Beerburgler that seems to function as an overflow liver .The common name Beerburgler was coined in the 2000 g.e. Criminal Affairs Public Report issued by the Godville Secret Police where it was noted that along with the Beer Mugger, a close biological relative of the Beerburglar, an estimated 60% of alcohol related robberies and thefts could be traced back to those two monsters. The Beerburglar, like its cousin the Common Hero is a humanoid being. It has a slightly short stature with average heights of 170 cm in the male variety and 150 cm in the female, which gives it some feelings of insecurity. It has hair on its head, eyebrows, a nose and a mouth. Two ears, two eyes, two feet, two toes and more often than not, really sore knees. It is in other words, indistinguishable from any heroine, at least on the basis of a first glance. Beerburglars almost always appear heavily laden with flasks, but again that is no clear sign and could easily indicate a hero. It is then, only on behaviour and alimentation that Beerburglars can be identified. The first of these indicators being the monster pointing something at you that appears to be not sharp enough to slice, but enough to hack and confer tetanus, and demanding all your booze. Thus, even if this is not a Beerburglar it certainly is a beer burglar and you can be certain of having lighter travels after that. Another indicator requires more intense scrutiny, for while it is believed that heroes consume only copious amounts of alcohol and nothing else, this statement actually holds true for Beerburglars. While heroines need actual sustenance, due to the Beerburglar's extra organ, it is also able to extract all necessary nutrients from its alcohol, even ones not present in the booze beforehand. If after prolonged observations, you see a being that seems to be a Beerburglar consume no non-alcoholic foods, you can be pretty sure that it is a Beerburglar after all. Lastly, the easiest identifier of a Beerburglar is it yelling "I'm a Beerburglar. Rraaaaaagh!" This theory suggests that Beerburglars are not truly a separate and distinct subspecies of the Common Hero but actually a corrupted and godless version. 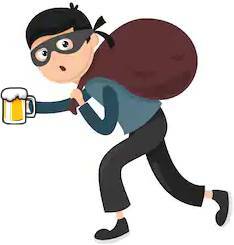 This most prevalent of origin theories suggests that Beerburglars were once like any other innocent hero, content in bashing in monster brains, stealing their gold and artifacts, returning to town and getting their booze the honest way; with the gold scavenged from the corpses of their foes. The Beerburglar, by some variable that has not yet been isolated, veered to a new path and cut out the middleman. It would instead ignore the cries of its god that called it to complete quests and gain glory by killing enemies, and instead take its beer by thievery. Turning away from their deity like this, Beerburglars undergo a mutation brought on by moral degeneration. The lack of divine influence causes the cells to follow the lead of their master and decide that they too, can do whatever they want, and so they wildly proliferate, growing an extra liver so as to welcome more alcohol and going on vacation to the brain, where they cause havoc and instill desires to rob and steal even more as well to keep the alcohol coming. This theory, the more popular among a certain type of intellectuals, places the blame not on the creature itself, but squarely among the heavens. It states that the Beerburglars are simply the results of another failed attempt to get heroes out of the tavern and onto the road again, seeking more glory. The supposed plan was to take all the booze by force, with the aid of a new minion: the Beerburglar. Taking the basic model of the hero, the gods decided to create one that would be able to take all the alcohol from Godville and down it in one go. This theory supposes that the gods never took into account that more beer could be produced and so their plan failed. This page was last edited on 13 January 2019, at 08:30.